July 20 - Saint Apollinaris, Bishop and Martyr - Optional Memorial - My Catholic Life! Ravenna, a city on Italy’s eastern, Adriatic coast, is a miniature Istanbul. It has perhaps the most impressive groupings of Byzantine churches and mosaics outside of the former Constantinople. In the centuries after the Western Roman Empire declined, Italy was ruled by various northern tribes. The Roman Empire was thus reduced to its eastern half in today’s Greece, Turkey, and Syria. Its capital was Constantinople, and its westernmost outpost, and only secure toehold on the Italian peninsula, was Ravenna. So Ravenna’s art and architecture reflect Eastern styles rather than Western ones. And it was in Ravenna where today’s saint, Apollinaris, was bishop for twenty-six years. And it is in Ravenna that two basilicas of impressive artistic and historical pedigrees still bear Apollinaris’ name. These two permanent proofs of his significance date from the sixth century. Together with an almost equally ancient church in Rome dedicated to his honor, they speak to Apollinaris’ legacy in the early church. The life of Apollinaris is the subject of conjecture more than analysis. Very little is known about him. Some traditions hold that he was a disciple of Saint Peter and came from Antioch, where Saint Peter was the first bishop. Other traditions, based on some historical evidence about the sequence of bishops in Ravenna, assert that he was bishop there in the late second century. Some legends speak of him as a martyr, while others say he suffered for the faith in the matter of a confessor but was not a blood martyr. Owing to these conflicting histories, and to his apparent lack of universal significance, Saint Apollinaris was removed from the sanctoral calendar in 1969, as part of the liturgical reforms after the Second Vatican Council. There was never any question, however, of removing him from the Church’s official roster of saints. After a long absence, the 2002 edition of the Roman Missal restored the Memorial of Saint Apollinaris. The older of the two churches of Saint Apollinaris in Ravenna contains an ancient mosaic that communicates the essentials. The mosaic is not peripherally located. It is front and center in the main apse of the church, in the direct field of vision of any and all who walk through its doors. It shows a man with white hair. He is old. His skull is shaved. It is the tonsure, showing his religious dedication. A large golden halo circles his head. He is a saint. He is wearing liturgical vestments—a chasuble and stole. He is a priest or bishop. His arms are wide open in what is called the “orans,” or praying, position so common to early Christian frescoes and mosaics. He is saying Mass. He is wearing a pallium, a small band of white lamb’s wool worn by Metropolitan Archbishops. He is the Archbishop of Ravenna. The twelve lambs, representing the faithful, look to the figure from both sides. He is an important pastor, a shepherd. His main garment is a white alb. In keeping with the mosaic’s age, and with Ravenna’s status as an imperial city, the alb looks more like a flowing Roman toga. The empire is alive and well. The figure is an equal to all the powerful of the city. Above the figure, tiny, dark stones spell out: ＋SANTUS APOLENARIS. Most of the church’s mosaics were wantonly destroyed, likely by the soldiers of a neighboring city, in the fifteenth century. But not this mosaic. It was famous then and is famous now. It is the most tangible evidence imaginable of the importance of today’s saint, an early bishop who suffered for a revolutionary new faith that knew about conquering death. Saint Apollinaris, we know little about you except what is most important. You were ordained to participate in the fullness of the priesthood of Christ. You gave witness for the faith that your people remembered and memorialized. May we lead lives that are equally deserving of honor and commemoration. 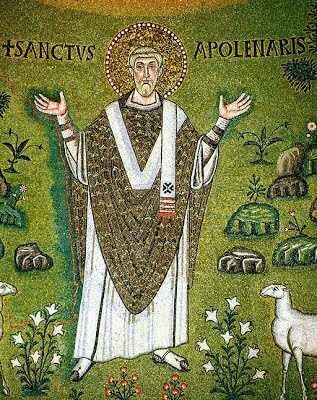 ST. APOLLINARIS was the first Bishop of Ravenna: he sat twenty years, and was crowned with martyrdom in the reign of Vespasian. He was a disciple of St. Peter, and made by him Bishop of Ravenna. St. Peter Chrysologus, the most illustrious among his successors, has left us a sermon in honor of our Saint, in which he often styles him a martyr; but adds, that though he frequently suffered for the Faith, and ardently desired to lay down his life for Christ, yet God preserved him a long time to His Church, and did not allow the persecutors to take away his life. So he seems to have been a martyr only by the torments he endured for Christ, which he survived at least some days. His body lay first at Classis, four miles from Ravenna, still a kind of suburb to that city, and its seaport till it was choked up by the sands. In the year 549 his relics were removed into a more secret vault in the same church. St. Fortunatus exhorted his friends to make pilgrimages to the tomb, and St. Gregory the Great ordered parties in doubtful suits at law to be sworn before it. Pope Honorius built a church under the name of Apollinaris in Rome, about the year 630. It occurs in all martyrologies, and the high veneration which the Church paid early to his memory is a sufficient testimony of his eminent sanctity and apostolic spirit. Reflection.— The virtue of the Saints was true and heroic, because humble and proof against all trials. Persevere in your good resolutions: it is not enough to begin well; you must so continue to the end.